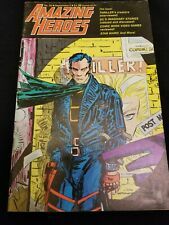 Infinity Inc. #23 (Crisis on Infinite Earths tie-in; Art by Todd McFarlane). I've been doing this for YEARS and have never had an issue. This issue has a Shazam vs. Superman battle as well as Marvel Family vs. All-Star Squadron. ALL IN NICE TO EXCELLENT CONDITION. NO.1 AND NO. 2. This includes Alaska, Hawaii, Puerto Rico and other US Territories. A TOP QUALITY COMIC. ALL-STAR SQUADRON #67 (DC Comics 1986) LAST ISSUE! JUSTICE SOCIETY (FN/VF) RARE! LAST ISSUE! In my estimation the book ranges in "NICE" (6.5) FINE to (7.0) FINE/VERY FINE condition. Very moderate wear to cover, spine, corners & edges. Small faint bend bottom right corner which affects interior slightly. ALL-STAR SQUADRON #35 1984 DC -SPECTRE APP. HOURMAN-VS-BARON BLITZKRIEG DEATH OF A ALL-STAR.VF . Aquaman appearance! Spectre back-up story adapted from materials in ALL-STAR COMICS #13, 1942 by Gardner Fox and Bernard Bailey with art by Ron Harris & Mike Gustovich! In my estimation the book ranges in "NICE" (6.0) FINE to (6.5) FINE condition. JSA story plus unpubbed Golden Age page! In my estimation the book ranges in "NICE" (5.0) VERY GOOD/FINE to (6.0) FINE condition. Moderate wear to cover, spine, corners & edges. Tiny chip bottom left corner. We estimate these books to be in NM (Range 9.0- 9.4) condition. We stand behind all of our books. We recently obtained a large collection of comics! The Huntress takes on the defense of the JSA as attorney Helena Wayne. Chapter One: "I Accuse!". Chapter Two: Witness for the Persecution! ------check out the pic for a great look--------------------------------------------------------------------------------- ----------------------------------------------------- - - grade vf. Art by Todd McFarlane. Infinity Inc #19. DC Comics ALL-STAR SQUADRON #36 SHAZAM vs SUPERMAN in NM 9.4 condition. High gloss, a couple of tiny spine stresses. Pages and covers firmly attached, near white colored pages. Bagged and boarded. The set consists of #s 1-4 [Complete Set]. · Set will be securely bubble wrapped and boxed to ensure condition. · Books are bagged and boarded [2 per bag]. · Many are NM to NM/MT condition. · Set will be securely bubble wrapped and boxed to ensure condition. The set consists of #s 1-8 [Complete Set]. · Comic book grading is subjective. These are my estimates based on over 40 years as a collector (and not that of a professional grader). ALL-STAR SQUADRON #1-67 & ANNUALS #1, 2 & 3 . ALL-STAR SQUADRON #1-67: 9.0 VF/NM Avg; All Direct! All Complete! All in Mylar! (wanted to replace several VF copies with more VF/NM &/or NM-/NM copies). 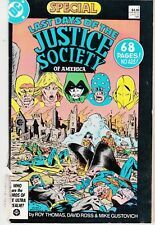 Last Days Of The Justice Society Of America SPECIAL #1 (1986) NM- Newstand Var. Comics in this condition have an aggregate of defects so extensive as to render them all but uncollectible in most cases. Even a poor copy, however, can be sought by readers and even collectors when better condition copies are not available at affordable prices. Infinity Inc. Twenty (20) High Grade DC comics. 1, 2, 4, 5, 6, 12, 14, 17, 18, 19, 20, 21, 23, 24, 25, 27, 28, 30, 35 and 50. This lot includes at least 10Todd McFarlane issues, the 1. st issue of the title and 6 specialCrisis cross-over issues. A limited number of minor bindery/printing defects are allowed. A light, barely noticeable water stain or slight foxing that does not detract from the beauty of the book is acceptable for this grade. Their condition ranges from FN/VF (fine/very fine) to NM (near mint). Make Supersized Seem Small. We take very detailed pictures so that you can see exactly what you are getting. We'll test it out and once we confirm the defect. ALL-STAR SQUADRON ~ VF Issue Lot of 32 Comics . ALL-STAR SQUADRON 32 ISSUES = 7.5 VF- Avg; New Bags/Boards, Great Lot/Set!All various issues within the All-Star Squadron series, all ranging FN to NM. ( GRADE) N M- CONDITION 9.2, HIGH GRADE, HIGH GRADE COPPER. "Dead Air.". Script by Len Strazewski, pencils by Mike Parobeck, inks by Rick Burchett. Cover by Tom Lyle. "Beware the Savage Skies!". Set in 1950, this eight-issue series helped revive the Golden Age versions of such heroes as Flash, Green Lantern, and Hawkman. Fumimura, Ikegami. Will Hojo recover?. FREE giveaways and blaring trumpets in 20 key categories. All books are FINE or better. More sets, more breakouts, more trade paperbacks, more movies and horror. This issue is out of print and hard to find! A great issue and a must have for any Comics or Justice Society Fan! ALL STAR SQUADRON # 52 in VERY FINE condition from DC COMICS. UNITED STATES ONLY. SECRET ORIGINS # 44 in VERY FINE condition from DC COMICS. UNITED STATES ONLY. Grades are a best approximation. I do my best to give the comic a fair grade. New Comics Added Daily. Over 2 Million Comics Sold! Publisher DC only Marvel Dark Horse IDW Image. Buy 3 comics, save 20%?. We want to be the Amazon for comics! Buy 2, save 10% ◦ Buy 15, save 25%. 694,000 more comics on our own website. Part 1 of 2, continued next issue. Script by Roy Thomas, co-plot by Dann Thomas, pencils by Todd McFarlane, inks by Tony DeZuniga. McFarlane/DeZuniga cover. The cover of this issues steals the show. As a comic book collector myself, I know that condition is very important. Original art is reinforced with multiple layers of cardboard. 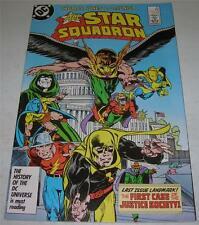 Here is All Star Squadron #36. CGC has given this copy a grade of 9.6, white pages. This is in the new style case. Bagged and boarded. Nice high grade set! These issues feature Crisis on Infinite Earths crossovers with appearances by Captain Marvel and Superman as told by Roy Thomas and Arvell Jones! This issue is out of print and hard to find! A great issue and a must have for any Comics or All Star Squadron Fan! For your consideration listed is Infinity Inc.1-53, Annual 1, 2, Special 1 all in NM/M Condition except 1, 42, 44 which are in NM- Condition, 2 which is in VF Condition and 28, 33, 34, 36 which are in VF/NM Condition. FANTASTIC FULL COMPLETE SERIES! 1ST PRINT! THE SUPER FRIENDS . ~~~ 7 COMICS ~~~. ~~~ THERE ARE TWO NO. 1'S ~~~. FANTASTIC EARLY TODD McFARLANE ART! 1ST PRINTS! Great VF Condition. INFINITY INC. #31 (1985) from DC COMICS.